As expected, Top Rank will be hosting a night of rematches in Tucson on May 11th. The card will compete with Jarrett Hurd vs. Julian Williams fight. Berchelt (35-1, 31 KO) stopped Vargas (25-1-2, 18 KO) in 2017 to win the WBC super featherweight belt the latter had taken from Takashi Miura and defended against Orlando Salido in a pair of insane wars. The two were set to go at it again on March 23rd, only for “El Alacran” to injure his right hand once again. 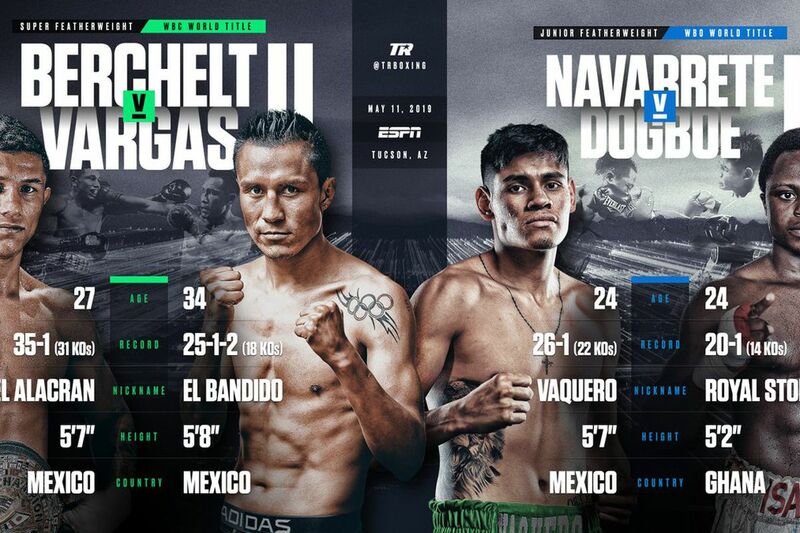 Vargas is Berchelt’s #1 contender and it’s been two years, making this a relatively reasonable rematch even though the first fight was nowhere near as competitive as the scorecards would make you think. Dogboe (20-1, 14 KO) challenging Navarrete (26-1, 22 KO) again after just five months feels like rushing it. “Royal Storm” was on his way to 2018 Fighter of the Year contention when Navarrete overpowered him in the Lomachenko-Pedraza co-feature. It wasn’t that Dogboe was having an off night; he was up against a larger man too durable and relentless for him to overpower. Even though both fighters are still developing at the age of 24, that doesn’t seem like a narrative that can change in half a year.